In 1996 the Doctor Who TV movie gave new hope to a generation of fans, but it quickly proved a false dawn. While the production’s successes and failures have been exhaustively documented, the script, with its unique perspective on the Doctor’s Britishness, has been given lesser attention. With the help of over 1500 fans who answered our survey, and input from screenwriter Matthew Jacobs, this Black Archive fills that gap. 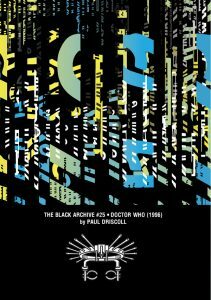 Paul Driscoll is a frequent contributor to the acclaimed You and Who series, and the author of The Black Archive #9:The God Complex and The Silver Archive #4: Stranger Things.